Overbite dentition is an abnormal relationship between the dental arches in which the lower jaw is shorter than normal relative to the upper jaw. Veterinary dentists classify this dentition as a Type 2 malocclusion; it is also called mandibular distocclusion or brachygnathism. Dog breeds commonly affected include Dachshunds, Shelties, and Collies but any dog or cat could be affected. Base narrow canines are often associated with this malocclusion. 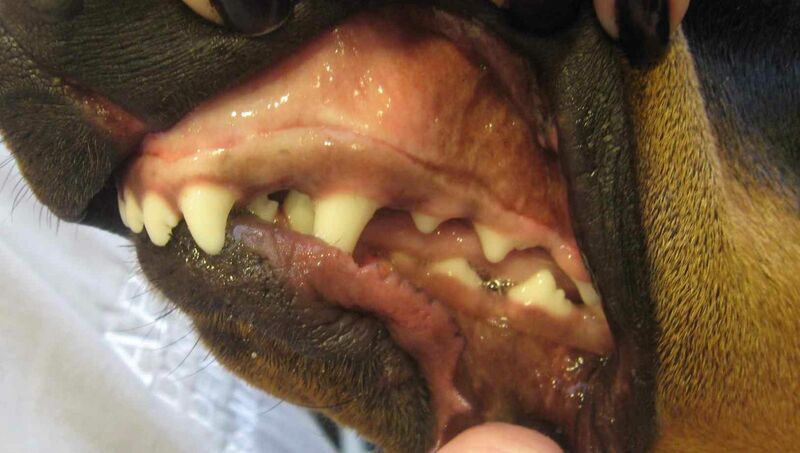 Overbite is often seen in very young puppies where interceptive orthodontics may be recommended. The idea of interceptive orthodontics is to address the problem early when the puppy’s facial bones are still growing. Extraction of all deciduous lower canines and incisors is sometimes performed to eliminate discomfort and promote forward growth of the lower jaw. Removing these teeth removes any impingement to mandibular growth and encourages maximal forward growth. Interceptive orthodontics should ideally be performed as early as possible to best increase the chances for success. Once a puppy has matured into adulthood, treatment is aimed at treating secondary problems such as tooth-on-tooth wear and soft tissue trauma. Depending on the severity, treatment options in adults include orthodontic movement, crown shortening with vital pulp therapy, or strategic extractions.